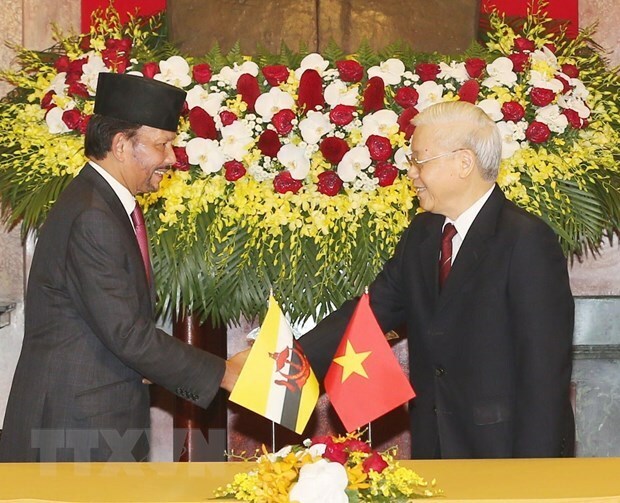 Hanoi (VNA) – Party General Secretary and President Nguyen Phu Trong and visiting Sultan of Brunei Haji Hassanal Bolkiah agreed to lift the bilateral relations to a comprehensive partnership at their talks on March 27. Welcoming the Sultan, Trong said that Bolkiah’s second visit to Vietnam after 21 years has great significance, marking the two countries’ friendship and cooperation, and upgrading it to a new height. The two leaders exchanged notes on the bilateral relations as well as regional and international issues of mutual concern. They stressed that the establishment of the comprehensive partnership is a result of positive and sustainable developments in bilateral relations over the recent past, thus renewing motivation to enhance bilateral collaboration in a more effective and practical manner, especially in politics, defence-security, trade, investment, education, people-to-people diplomacy, as well as cooperation within the Association of Southeast Asian Nations (ASEAN) and other multilateral frameworks. Both sides agreed to intensify all-level delegation exchanges through all channels to strengthen political trust and mutual understanding so as to create a firm foundation for cooperation in all fields. They also highlighted the importance of maintaining the effective implementation of the Joint Commitment on Bilateral Cooperation, and considered the establishment of new cooperative mechanisms. Both host and guest confirmed that potential for bilateral economic cooperation has yet to be fully tapped, and agreed to strive for 500 million USD in two-way trade at an early date, through trade and investment promotion as well as business connectivity activities. Trong lauded Brunei for remaining the fourth largest ASEAN investor in Vietnam, with nearly 200 projects totalling over 1 billion USD. He committed that Vietnam will continue creating favourable conditions for Bruneian enterprises to do business and investment in Vietnam, particularly in important fields such as infrastructure, energy, high-tech agriculture and industry, food processing, tourism, and services. The Brunei Sultan pledged to support Vietnam produce products that meet international halal standards in order to approach Muslim markets. Lauding national defence-security cooperation as a spotlight in bilateral relations over the years, both leaders spoke highly of the effective implementation of the memorandum of understanding (MoU) on defence cooperation in 2005 and the MoU on naval cooperation in 2013. They agreed to work closely together at multilateral defence forums, especially within the ASEAN and ASEAN frameworks, and highlighted the importance of security collaboration amid regional security challenges. The two sides promised to share experience and expand partnership in the fight against trans-national, organised, human trafficking, terrorist, and cyber crimes; as well as discussed the signing of agreements on extradition, judicial assistance, and transfer of sentenced persons. The two leaders welcomed the government-level agreement on the establishment of a hotline to support fisheries at sea. They also pledged to further expand aquaculture cooperation, share information regarding legal enforcement at sea, and cope with security challenges at sea in order to ensure maritime safety and freedom. Furthermore, they discussed measures to enhance culture-education ties, aviation connectivity, and the facilitation of immigration procedures so as to raise mutual understanding and the bilateral friendship. The Brunei Sultan vowed to consider the host’s proposal to amend the visa waiver agreement by increasing the duration of non-visa stay for diplomatic, official, and general passport holders. On regional and global issues of shared concern, the guest congratulated Vietnam for successfully hosting the second DPRK-USA summit in February, thereby improving the country’s stature in the region and the world. The two nations will work closely together as Vietnam and Brunei assume the roles of ASEAN Chair in 2020 and 2021, respectively. They will contribute to the process of building the ASEAN Community; effectively realise the ASEAN Community Vision 2025; step up linkage collaboration; narrow the development gap; deepen external relations; and uphold ASEAN’s central role in the regional architecture in the principles of openness, transparency, and inclusiveness. They consented to continue cooperating and coordinating closely at other multilateral forums, particularly the United Nations, ASEAN, the Asia-Pacific Economic Cooperation (APEC), and the Asia-Europe Meeting (ASEM). Meanwhile, they will promote regional economic connectivity via multilateral economic agreements to which both of them are members, such as the Comprehensive and Progressive Agreement for Trans-Pacific Partnership (CPTTP) and the Regional Comprehensive Economic Partnership (RCEP). Reiterating their consistent stance on the East Sea issue, they affirmed the principle of peacefully settling disputes in line with international law, including the 1982 United Nations Convention on the Law of the Sea (UNCLOS). Host and guest stressed the need to strengthen trust as well as the importance of non-militarisation and self-restraint from activities that could complicate tensions in the East Sea. They reaffirmed support for the full and effective implementation of the Declaration on the Conduct of Parties in the East Sea (DOC) and the acceleration of negotiations to reach an effective and practical Code of Conduct in the East Sea (COC) as a roadmap.